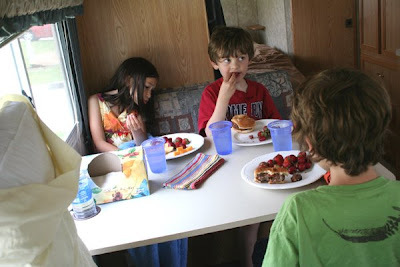 When the family did arrive, the big kids convinced them to take them on a spin around the block in the RV, then to let them eat lunch in there. Serious excitement! 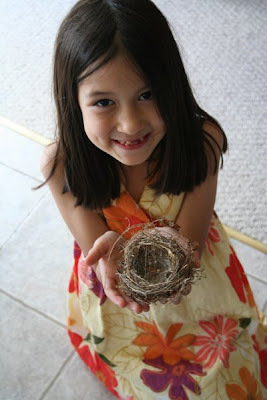 Elizabeth later found an empty nest lying on the ground in the backyard. She asked mom to make a few felted eggs for the nest. Mom obliged. 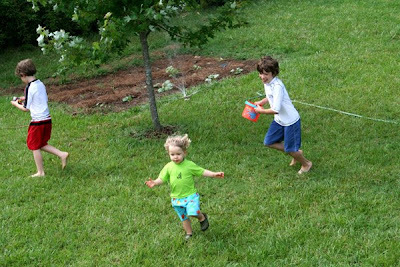 When family had to leave, we decided some newly transplanted garden plants could use a bit of water, which seemed like a good excuse to get wet. We all had a great time with Paul's extended family. We hope they come again soon! Lunch in the RV really does sound like fun! And I love your felted eggs. Must learn how to do that. Are they needle felted? When I was a kid, my family built a cabin in the Ozarks one summer. A real live, fell the trees, notch the logs kind of cabin, sans electricty and running water. While everyone else camped out, my mother borrowed an RV from somebody at my Dad's office, ran the generator 24/7 to keep our pet parrot, who was along for the ride, comfortable, and we all had daily showers. This explains a lot about me. So I am wholly in favor of that lunch in the RV! The little felted eggs look so cute in the nest. 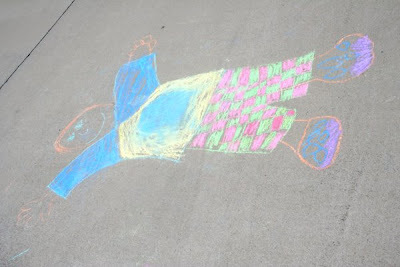 The RV sounds like it was lots of fun...and chalking, too! 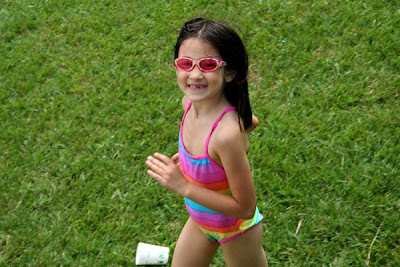 How fun it all looks! 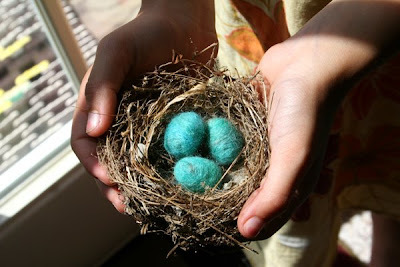 Elizabeth's nest and felted eggs look just like the Robin's nest in our maple tree.